Virtually all ACA studies using Thomson’s ISI citation indexes used only the first author to retrieve the cocitation counts. Therefore, this has been a methodological issue in ACA study. First, this chapter introduces two classifications of author cocitations (Rousseau & Zuccala, 2004; Zhao, 2006). Second, literature survey of three studies is conducted to review what has been done to deal with this issue. Third, we discuss the data and cocitation matrix generation system used in our study. Fourth, using our data produced by the cocitation matrix generation system, principal component analysis and non-metric multi-dimensional scaling (MDS) are applied to compare the differences in the process and outcomes of using different cocitation matrices. Finally, we discussed the results of comparative analyses of our study and three other studies in this area. In doing so, the treatment of the diagonal values in a cocitation matrix, the number of authors in all author ACA and first author ACA are critical determinants of ACA outcomes such as number of factors, total percent of variance explained, goodness of fit, and so forth. In future research, it is imperative to use the same assumption in regard to the treatment of the diagonal values, the selection of authors using the same criterion, and so forth. If these are not uniformly standardized, the results are always incomparable and have less meaning. Three conclusions can be reached based on our study. First, all author-based ACA is better to capture all influential researchers in a field than first author-based ACA. It identifies more subspecialties. Finally, all author-based ACA and first author based ACA produce little differences in stress values. 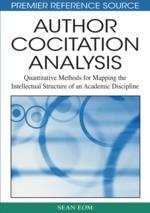 Author co-citation analysis analyzes the author cocitation frequency matrix to infer the intellectual structure of an academic discipline. However, the term author co-citation has not been fully defined. Because of imprecise definitions and restrictions of ISI databases, many ACA studies may have used various cocitation counts. This imprecise definition of author co-citation can lead to imprecise co-citation counts on the diagonal values as well as non-diagonal values. Rousseau and Zuccala (2004) present a classification of author co-citation forms. The pure first-author cocitation occurs when the reference list of a publication includes at minimum one publication with A as the first or single author and at minimum one publication with B as the first or single author, with one exception that all articles with these two authors (A and B) as co-authors are excluded in the process of computing co-citation frequency. The examples used here come from the reference list of (Sean B. Eom & Farris, 1996). Example A shows that there is one occurrence of cocitation between Eom and Farhoomand. Example B does NOT yield pure first- author cocitation between Smith and Thomas. Eom, S. B. (1996). A Survey of Operational Expert Systems in Business (1980-1993). Interfaces, 26(5), 50-70. Eom, S. B., Lee, S. M., & Kim, J. K. (1993). The Intellectual Structure of Decision Support Systems (1971-1989). Decision Support Systems, 10(1), 19-35. Farhoomand, A. F. (1987). Scientific Progress of Management Information Systems. Data Base, 18(4), 48-56. Smith, K. & Thomas, T. (1992) The k-procedure, The Gamma Journal. Thomas, T. & Smith, K. (1992) More details about The k-procedure, The Gamma Journal.